Statistics for ailments like lower back pain are skyrocketing – according to the American Chiropractic Association, 31 million Americans are experiencing lower back pain at any given time. It’s actually one of the most common complaints in doctor offices worldwide. While many people nurse their pain with ice packs and pain killers, it’s much better to investigate the source of your discomfort: sore muscles. Sure, getting massaged regularly is helpful, but you also have to stretch and straighten your muscles for complete pain relief. 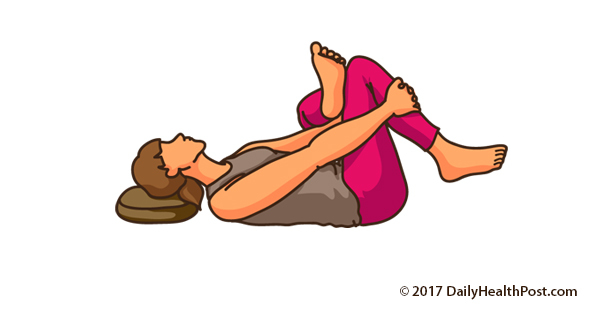 These 7 easy stretches for lower back pain relief will do wonders for anyone who spends most of their day – sitting in a stationary position – or anyone who has back pain regardless of their level of activity. 1. Sit straight on a sturdy chair, with your knees far apart. 2. Place your left hand on the seat on the chair and grab onto the underside, keeping the back of your hand towards the ceiling. 3. Lean to your left side without bringing your chest towards your knees. Keep your shoulders relaxed and straight. Bend your head slightly towards your left shoulder. 4. If you experience pain, place a pillow on your left thigh and lean against it as your stretch. 5. To get a stretch in your deeper back, roll your right shoulder inward and lean further to the side. 7. To finish the stretch, bring your right arm in front of your body and above your right shoulder and off to the side. Hold for a few breaths. 8. Roll your right shoulder further inwards, one breath at a time. 9. 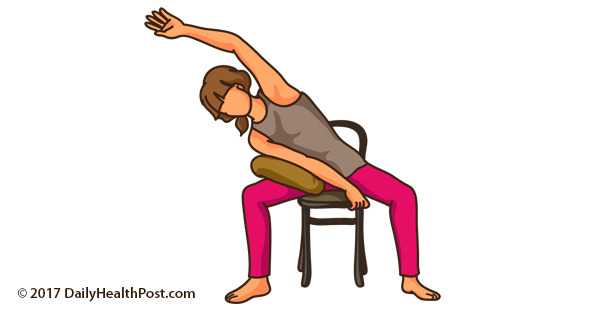 When you no longer feel a stretch, rest our right arm on the left thigh and return to the original position. 10. Relax, and repeat on the other side. 11. Grab a chair and get to stretching! 1. Hold this stretch for 30 seconds, repeating it with each leg. 2. Start by sitting on your mat with both legs out in front of you. 3. 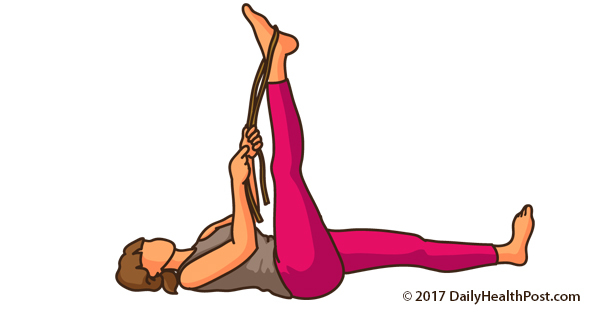 Place a rope or resistance band under the arch of one foot. Keep the opposite leg extended on the ground. 4. Lean back so that the leg you’re stretching is at a 90-degree angle with the other leg on the ground. Breathe and keep the small of your back in contact with your mat. 5. Point your toe or bend your knee slightly to explore the stretch a bit more. 6. Hold for a few breaths, return to the starting position and repeat on the other side. Like What You're Reading?Get one daily health post update delivered to your inbox each AM. 1. Lie on your back and bend the left knee. 2. Use your hands to pull the knee into your chest grabbing onto your shin or hamstring. 3. Keep your back on the ground as you do so. You should feel this in the hip and buttocks. 4. For a deeper stretch, bring your nose towards your knees, keeping your shoulder loose. 5. Hold the stretch for 5 to 30 seconds, repeat 2-3 times, and stretch 3 times a day. 6. This stretch is both relaxing and therapeutic. Add it to your morning stretch routine to feel relief all day long. 1. Lying on your side, extend your lower arm out at a 90-degree angle from your body. 2. Take your top leg and cross it over your bottom leg, pulling it towards the floor with your bottom hand. 3. Drop your head down, place your top hand on your rib cage. 4. Breathe in, and pull on your ribs and twist your torso to the other side as you exhale. 5. Come up to the original position as you inhale. Do this back-and-forth for 4-5 breaths. 6. For your next breath, twist completely to the side, resting both shoulder blades to the ground. Hold for a few deep breaths. 7. Hold this stretch for 30 seconds per leg or go longer if you’ve done some active stretching at the beginning. 8. You might get a few satisfying back cracks out of this one! 1. 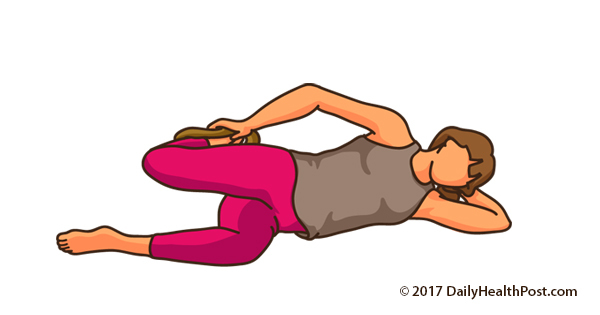 While lying on your back, bend both knees and place one ankle over the opposite leg, just above the knee. 2. Raise the bottom leg off the floor toward your chest until you feel the pull in the pelvis. 3. Hold for 5 seconds. 4. Slowly release the lower leg back to the floor, straighten the top leg, and switch sides. 5. You’ll feel this stretch in you lower back, buttocks, and the back of your thighs. 1. Start in a kneeling lunge position, with your right knee in front of you, in line with your ankles and hips. Your left knee should be in line with your back and hips, with the left shin on the ground behind you. 2. Squeeze your glutes to rotate your pelvis inward. 3. Next, squeeze your abdominal muscles. 4. Lastly, while keeping your glutes and abs activated shift your weight onto your front knee. Do not overstretch. 5. Hold for a few breaths. 6. Repeat with the other leg. 7. Hold this stretch for 30 seconds, then switch legs and repeat. 1. 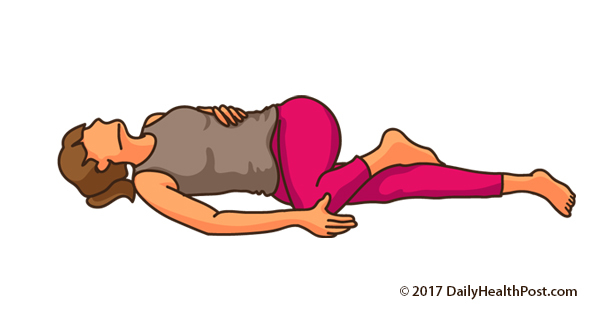 Lie on your side with one arm below your head, supporting your neck and your lower leg bent slightly and supporting your top leg. 2. Place a towel around your top ankle and hold on to both ends with your top hand. 3. Activate your abs and bring your top hip backward. Keep your thigh straight and parallel to the ground. 4. Hold this stretch for 30 seconds on each side – it’s a good idea to do this one twice per side. 5. For best results, repeat this stretch twice daily: before and after exercise. 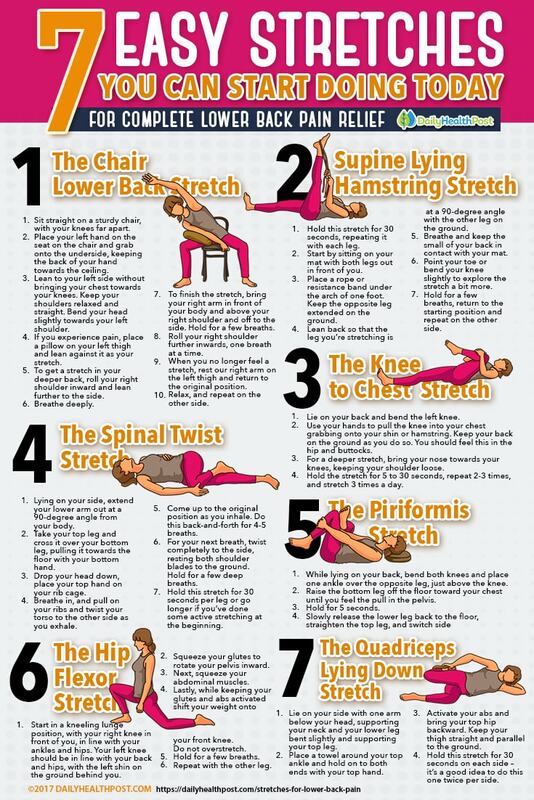 All of these stretches are beginner-level and quick to do, which could help significantly with back pain management. Make sure you take deep breaths as you perform these stretches for lower back pain relief. (1) Do back strengthening and stretching exercises such as the ones above at least 2 or 3 times a week. (2) Practice proper posture while sitting and standing. (3) Avoid heavy lifting. If you do lift something heavy, bend your knees and keep your back straight to get the right muscles working and avoid injury. (4) Stay active and eat a balanced diet. Don’t be afraid to lift some weights along with your cardio routine! If you are overweight, lose weight to keep some strain off your back. Despite what you may have started to believe, it is possible to live without back pain. By practicing these lifestyle changes and stretches for lower back pain, your back will feel strong and relaxed after just a few weeks. If you experience severe pain, however, it might be worth booking an appointment with your chiropractor to make sure your spine is in perfect alignment. Do Not Miss The Blood Moon 2018! Duration And Date Of The Lunar Eclipse.